The maritime regions of Québec are home to a wide variety of natural environments that attract hundreds of different species of birds. From the islands in Bas-Saint-Laurent to the mountains of Gaspésie and from the coastline of Côte-Nord to the cliffs of the Îles de la Madeleine, each region offers great bird-watching sites. Here are a few worth visiting! Bas-Saint-Laurent is dotted with islands, mudflats and marshes that are easily accessible bird-watching sites. Off Rivière-du-Loup, Île aux Lièvres (Hare Island) et Île du Pot à l’Eau-de-Vie (Brandy Pot Island) provide protected nesting areas for several species of birds, including great blue herons and razorbills. 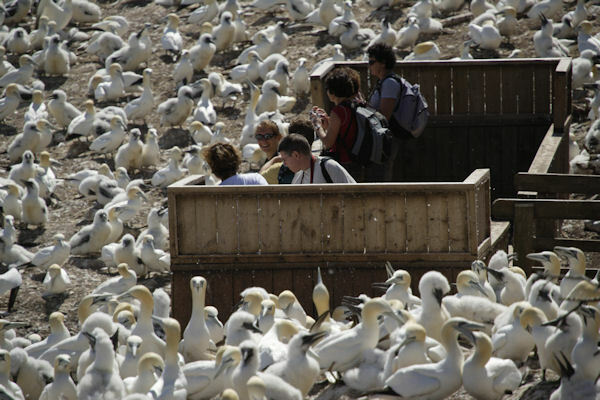 Basques Island, off Trois-Pistoles, is a migratory bird sanctuary for 229 bird species. Inquire about excursion times before you head out to visit these islands. A sea excursion in the Saguenay–St. 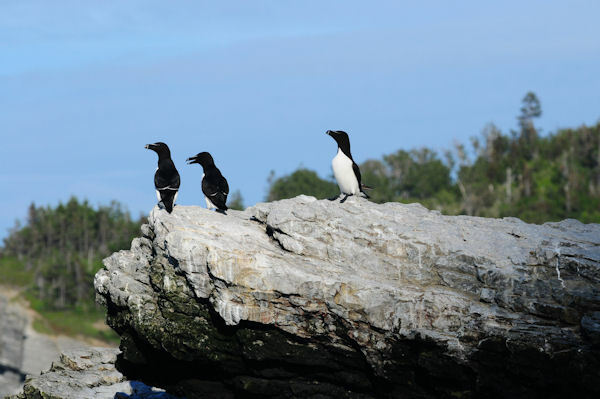 Lawrence Marine Park will give you the opportunity to observe many different species of seabirds, including common loons and black scoters. You can also see birds of prey in the mudflats of Kamouraska as well as about 10,000 couples of common eiders in Parc national du Bic. With several lakes, Parc national du Lac-Témiscouata offers the perfect environment for the bald eagle the largest bird of prey in Canada. You might spot one gliding high up in the sky, spreading out its long and wide wings spanning up to 2 metres, or scanning the horizon perched at the top the highest trees. The Gaspé Peninsula is home to a variety of habitats ranging from the seashore to the arctic-alpine summits of mountains. Thus, several species of birds that usually live in very different climates thousands of miles apart cohabit in this region. National parks and wildlife reserves are obviously some of the best places to observe birds. For example, Parc national de la Gaspésie and the Réserve faunique de Matane are home to about 150 bird species each, including harlequin ducks and golden eagles, while the cliffs of Forillon National Park are nesting sites for many seabird species including black-legged kittiwake. Parc national de l'Île-Bonaventure-et-du-Rocher-Percé is renowned for its colony of 110,000 northern gannets, the largest and most accessible such colony in the world. Located at the eastern tip of the peninsula, between Gaspé and Percé, the Malbaie Barachois is a nesting site for two threatened species: yellow rails and Nelson’s sparrows. Over 200 bird species have been sighted in this 11-km2 (4-sq. mi.) area! The red cliffs, sand dunes, freshwater ponds and green hills of the Islands are distinct habitats that attract a wide variety of birds. Among the species commonly found in the Îles de la Madeleine are Wilson’s snipes, black-headed gulls and Bonaparte’s gulls. 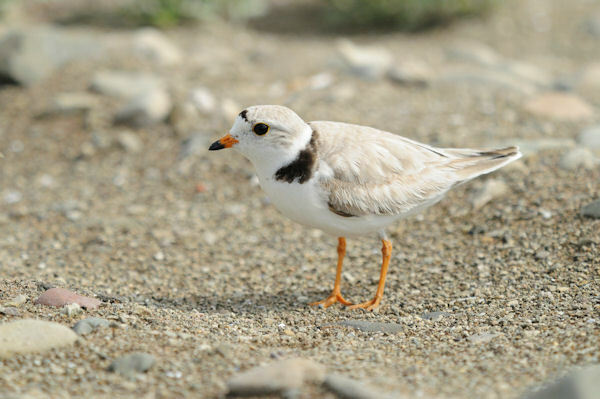 From late April to mid-May, you can observe a globally threatened species on the beaches of the Îles de la Madeleine: the piping plover. The Islands are the only place in Québec where this species nests. 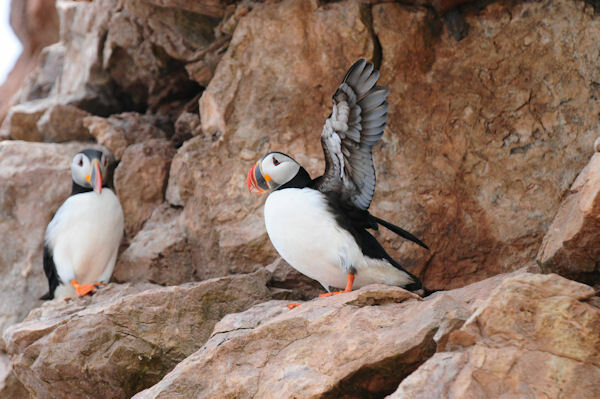 Rocher aux Oiseaux (Bird Rock) is one of the most popular bird-watching sites in the Îles de la Madeleine. Located 32 km (20 mi.) north of Grosse-Île, this migratory bird sanctuary is off limits to visitors; however, it is possible to approach the island by boat and thus observe the thousands of birds that nest there. Other sites worth exploring are Brion Island, an ecological reserve that shelters nearly 140 bird species including great cormorants and arctic terns, and L’Étang à Ben, a staging area for brants. Stretching from Tadoussac all the way to Blanc-Sablon, Côte-Nord is an immense region. While driving along the coast on Route 138, you will discover multiple bird-watching sites. The Tadoussac dunes are a unique observation site where you will probably see the boreal owl, a little-known bird of prey. Further east, be sure to stop in Longue-Rive to visit the second largest salt marshes in Québec. Participate in a sea excursion that will take you around Corossol Island, in the Sept Îles Archipelago. This migratory bird refuge is one of the best bird sanctuaries in Côte-Nord in terms of the number and diversity of species. While the largest concentration of bald eagles in Québec is found on Anticosti Island, the star of the Mingan Archipelago National Park Reserve is the Atlantic puffin, which steals the spotlight from the park’s many other seabirds. Wildlife Observation: The Best Places to Add to Your Itinerary!